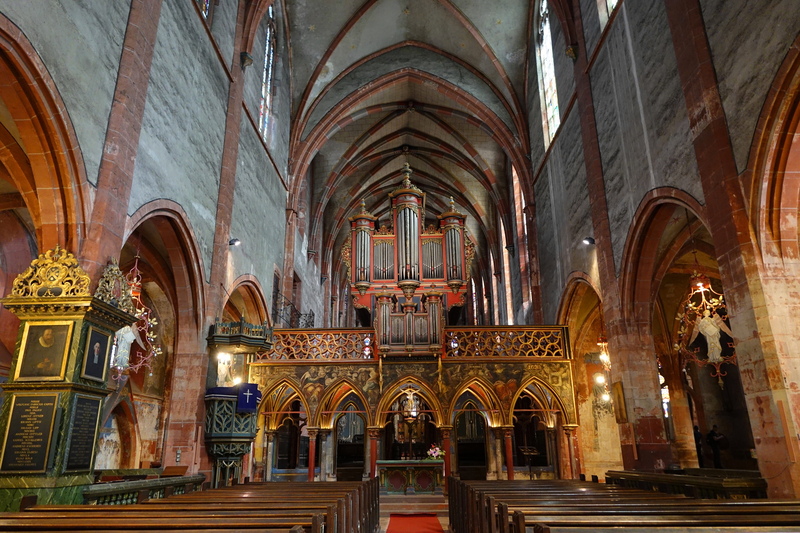 The ‘Young’ Church of St Peter, is an old and unusual church in Strasbourg, France. The oldest, and lowest part of the church is the burial crypt, which was built-in the 7th century. The church itself was consecrated in 1053, and three of the remaining columns supporting the arched interior galleries in the church date from the 11th century. The bulk of the church as it stands now was built between 1250-1320 and many of the frescoes you see are originals from the 14th century. In 1682, the church was divided into two sections, half for catholics and the other half for protestants, which seems quite forward thinking and civilized, doesn’t it! 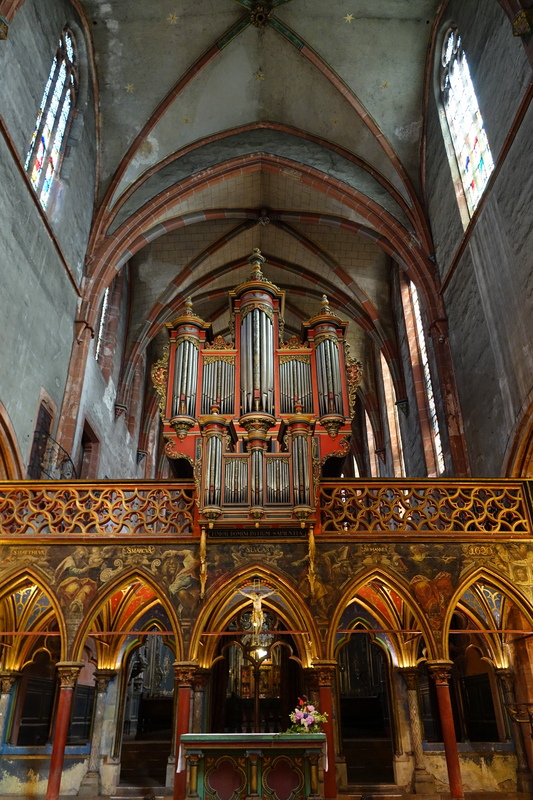 The pipe organ is a relative newbie, built-in 1780. 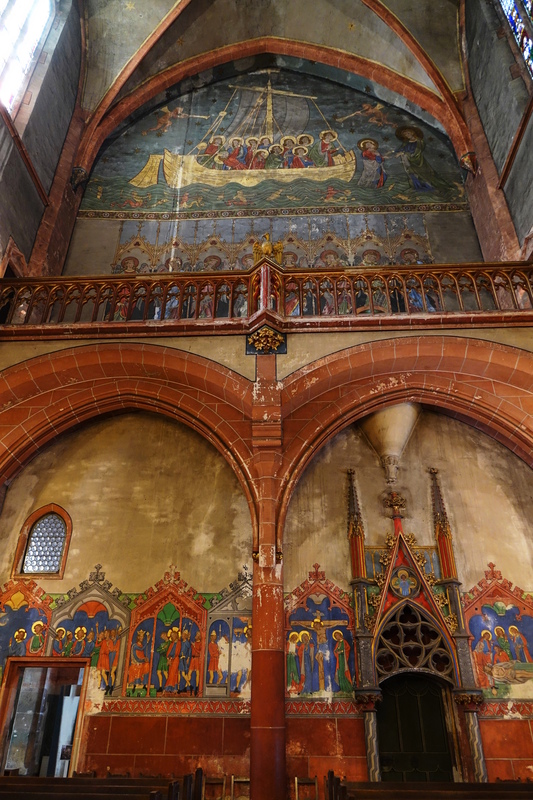 Strasbourg is full of old and amazing churches, but the old, ‘Young Church of St. Peter’, is off the beaten path, less visited, and remarkable in terms of history, architecture and art. All of these factors combined create a truly amazing sense of ancient sacredness. It is a church you may well want to linger in. Another one I hadn’t heard of — thank you, Cindy! Amazing how one church can suffice for many religions. Hmm, maybe if we did more of that today, the surplus money could be shared with the poor and hungry?? From so long ago in the year that started with 10 – -! Wow, I guess I never realized how ancient places like this are, Cindy. 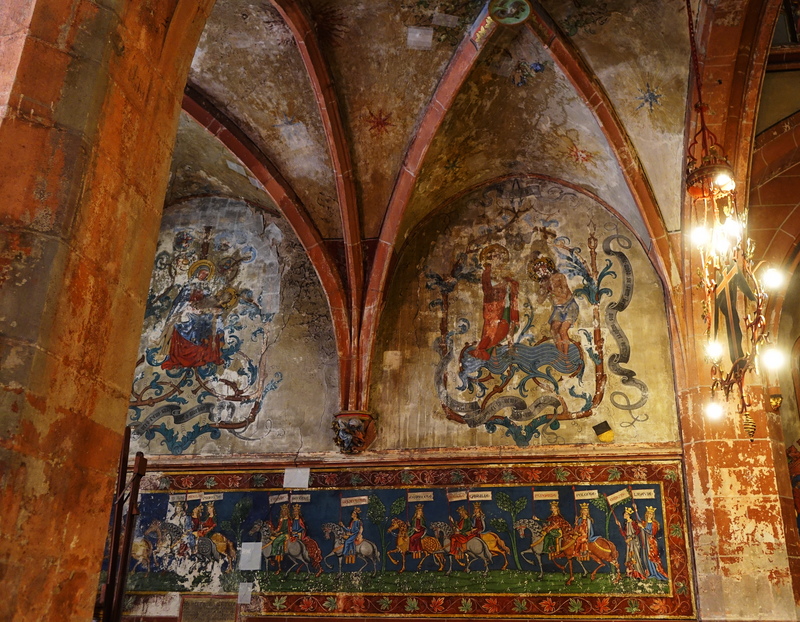 The relics and frescos with intricately painted stories amazed me. It hardly looks as old as the dates reveal. No bare stone walls. I love it too. We are thank you Lavinia, although it is quite hot, 99 degrees when I went to civilization today and just a bit cooler at The Holler. Simply fabulous. In the UK, we only have hints at what some of our churches must have looked like before the Reformation – something like this, I imagine! Love the idea of splitting it into two sections, one for the RCs and one for the Ps – how very egalitarian; if only the rest of the world had been that far-sighted! I so agree with you and wish the world would be equivalently tolerant today! At times we seem to be regressing into more and more hostility and intolerance towards difference. This church is an exception isn’t it! Loved your comments and love the UK’s gorgeous churches. Interesting about the post Reformation changes. I did find the art work in this church to be just so warm, welcoming and unusual. Exquisite. How amazing that they shared the church. Very possibly a unique situation. Would love to know more of the history of the people who managed to do that. Have enjoyed this trip very much. Missed some since my husband went back into the hospital. So, I’m trying to catch up now. Thanks, Cindy. He has Idiopathic Pulmonary Fibrosis which is progressive and incurable. They removed all the cancerous tumor in his lung this spring, but the surgery seems to have caused some deterioration and lowered his resistance to pneumonia. Antibiotics and steroids have him back to work now. It’s challenging, but he is a very determined resilient person. And we laugh a lot in spite of the hard times. Many moments of pure grace. The truth is no person knows who they actually are until they face severe trauma personally, which of course, everyone eventually has to do. And then, maybe, this becomes the test for them. My choice to myself is how will I respond. All I know all the time, is that all people will suffer. I guess it is really what to do with this that matters. But, I am just telling you what you actually know. You are already way ahead of me in figuring this out. Yes. I fell in love! Not hard to do with places like that! In much poorer times people really appreciated the arts, its great that through your skills we can all share the beauty which must have taken ages to create. What an interesting point you make, that people who have less may appreciate art more. Afterall, if you live in a palace surrounded by art, this church may seem less impressive. I always imagine these amazing churches providing comfort and beauty to people with little in terms of possessions or power and now you have solidified these thoughts in my mind. Thank you. Absolutely stunning, I do love to visit places of worship when I travel. So spiritually beautiful Cindy! I was really embraced in my spirit while viewing like I have been there before! One of those deja- vu , moments! True enough! We can’t overlook what’s to be learned by the past. Let’s hope those with the power to change things embrace the same philosophy. This is one of my favorite posts lately Cindy!! So gorgeous! and surprisingly old and well preserved. Loved the Angel light fixture!! Does it still function as a Catholic/protestant church?? 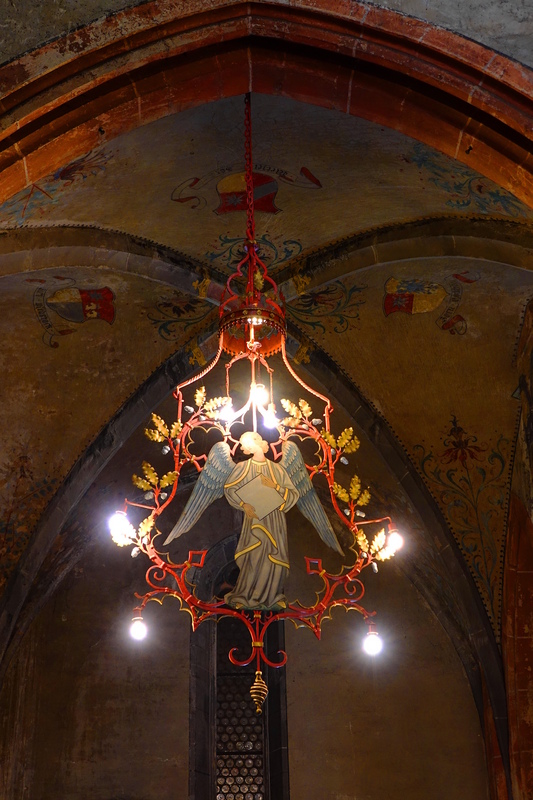 If you are like me and adore church interiors, you will love this French Church. What a lovely church, with an interesting history and the colours are utterly stunning. It makes one feel as though you are walking through the church. Quite often churches off the beaten track, hold many a gem! Yes, the lesser visited churches are often the most rewarding to visit. My husband and I got locked in an old church at night in Austria. Your comment reminded of this. I need to do a post on it. We had to use the flash in my camera to see a nano second per flash. It was quite an experience! Wow amazing and gorgeous. 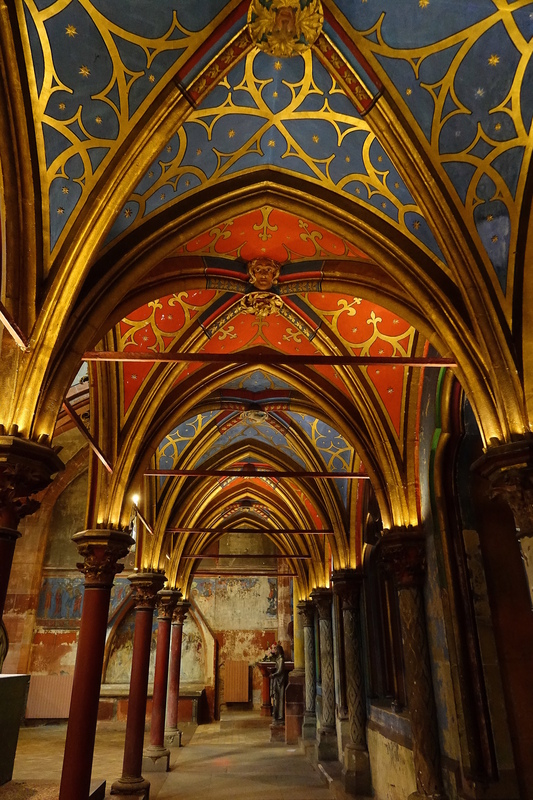 I know such craftmenship and work went into these old cathedrals, but I often wish modern churches had such color! Yes this church has such amazing warmth and such a welcoming feel. Too many of our churches are devoid of these qualities which is truly a shame. Amazing life you live. Thank you for sharing. Magnificent structures like this leave me in awe. Beautiful. Just spectacular! Thanks for posting! Super blog! Thank you more for the kind appreciation! Very interesting post, Cindy! I agree it was rather forward thinking to divide the church between Catholics and Protestants. Often it seems that Catholics view “Catholic” and “Christian ” as being synonymous. Thanks and happy you enjoyed! Great work of dedicated and inspired craftsmen given to us so well by you; also skilled, dedicated, and inspired. Thank you. Ahhhh, so thoughtful of you and so appreciated too.